Dinner Plates 10" - 11"
Pottery Avenue’s BLISS Cracker/Olive Serving Tray is a beautiful addition to any collection, and the perfect serving tray for polish pottery new-comers! Dimensions: Approx. 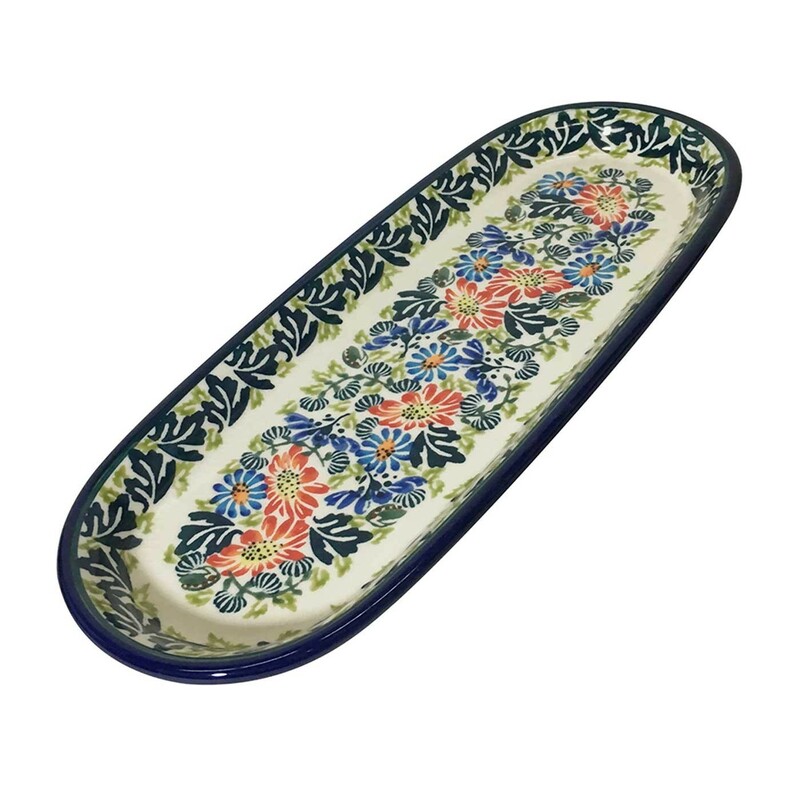 11.25" x 4.5" x 1"
Pottery Avenue’s Cracker/Olive Serving Tray is a beautiful addition to any collection, and the perfect serving tray for polish pottery new-comers! With it’s slight lip to ensure your food stays in place, this serving tray is ideal for presenting appetizers,(see uses below). Use this dish with item 1430 (our Baguette Plate) for sandwich makings. These plates are also oven, freezer, dishwasher, microwave safe, just as all the Polish Stoneware is. Warm in the oven to keep warm for your baked or warm items, put a bowl in the middle or side and serve dips and relishes. This tray makes a wonderful gift! • Dimensions: Approx 11.25" x 4.5" x 1"
• To insure longevity of your stoneware, it is recommended not to put the piece too close to the heat source such as the broiler or bottom of the oven. "Contact your Pottery Avenue personal shopper for more information." ©2019 Pottery Avenue By Pangaea Trade Inc. All Right Reserved.